Happy Thursday Y'all! We are out of school yet again today. We have officially been out of school for a full week. I was finally able to make it out of the house yesterday evening to go get my hair done and do a little shopping with my mom, and I'm hoping we'll be back at school tomorrow. Today I'm sharing some of my favorite hair and skin care products. I love love love trying new beauty/hair/skincare products so today's products include some of my old faves and some new ones as well. 1. MOROCCAN OIL has been one of my faves for YEARS. It leaves my hair feeling so healthy and soft, and it doesn't hurt that it smells amazing either. 2. I got the Origins CLEAR IMPROVEMENTS CHARCOAL MASK in November's Sephora box and will be using it from here on out. I've been using it once a week and it has helped my "stress breakouts" tremendously. 3. I got this DRY BAR DRY SHAMPOO in my Sephora box as well and it's a new favorite of mine. I love that it doesn't feel heavy on my hair, and it doesn't leave that "dry-shampoo texture" in my hair either like most dry-shampoos. 4. My sweet hubby got me a T3 HAIR DRYER for Christmas and it has definitely lived up to all the hype. It takes me about three minutes to dry my hair now, compared to ten with my old dryer. 5. I got this SKIN PERFECTING BHA LIQUID as a free gift with one of my Nordstrom purchases, and it has worked wonders. I have a lot of scaring on my face from recent breakouts and it has cleared up some of my scars and taken away redness. 6. I have tried a ton of different heat-protectants for my hair and this DRY BAR HEAT & UV PROTECTOR is the best thing I've ever used. I put it in my hair, along with my Moroccan Oil before drying my hair and it leaves my hair feeling SO soft. 7. This DRY BAR HYDRATING SHAMPOO has quickly become a favorite of mine as well. I have seriously been loving all the Dry Bar products lately. 8. And of course if I can't use the shampoo alone, the DRY BAR HYDRATING CONDITIONER is just as good as the shampoo. I've seen so many Moroccan Oil products that I'm intrigued by them. I have curly hair, so I think I might need a different type of this for curly hair or do you think this works on curly hair too? I think the oil would work for curly hair too! It helps a lot with my frizz and fly aways and make my hair feel healthier. 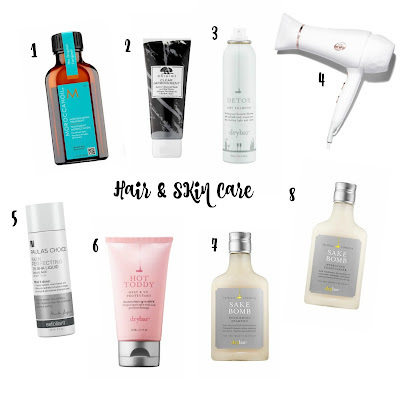 I've seen certain products that Moroccan Oil makes specifically for curly hair too though!